In software development, Import/Export is a technique to read and write data from files. We have multiple data file format to store our valuable data like png, jpg, xls, xlsx, pdf, txt, sql, etc, from where we need to read and write data. Every technology has its own technique to read and write data from files. 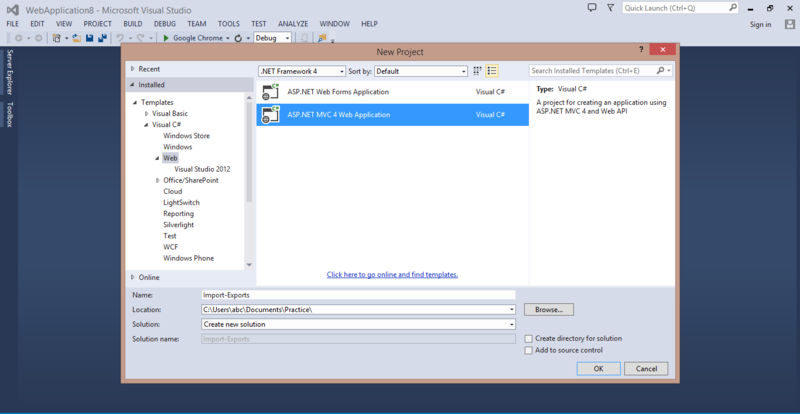 Here, I am using the c# programming language to perform this task through ASP.NET MVC Web Application. Github link: Click here for download the demo application. 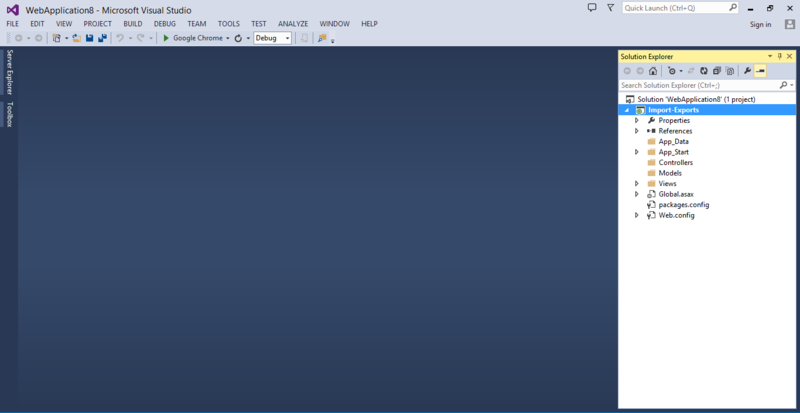 Note: I am using visual studio 2013, Follow the steps to create your application for Import and export excel file data. 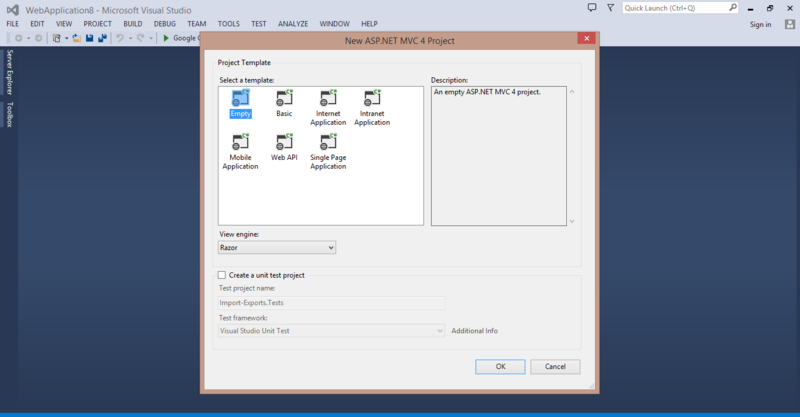 Create a new application click on File > New > Project > Templates > Web > ASP.NET MVC 4 Web Application. Enter the project name in Name text box like “Import_Export“. Select the location from Location drop-down where you want to save your project. Select “Add to solution” from Solution drop-down. 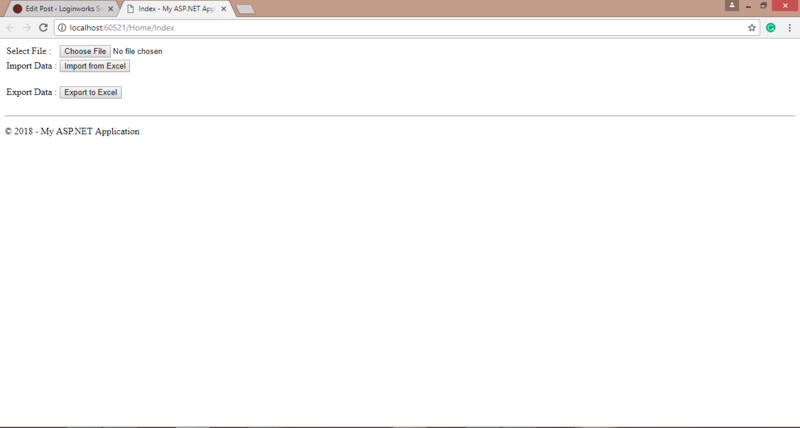 Note: If a new window is open then select Empty then Click Ok.
Now, new Empty MVC application is created successfully. Enter class name as “Employee.cs“. Add the following code to Employee.cs class. Enter class name as “ExcelData.cs“. Click the Add button to add it to your project. Right-click the References folder and Choose Add Reference. Find and select the Excel assembly that was contained within your download. Click the Ok button to add it to your Project. Click “Install” on the first option that appears. Add the following code to ExcelData.cs class. Add a controller, Open solution explorer > Right click on Controllers folder > Add > Controller.. Enter Controller name Like “HomeController“. Add the Models references to the controller. And also add the following namespace for data and file communication. Replace the Index() ActionResult method with following code. Add the following ActionResult method to the HomeController for Import/Export Excel file. Add a view, Right click on Index method > Add view > Click Add button. Replace the Index.cshtml content with the following content. Create an Excel file with two column “Id” and “Expectation“. Add some data in excel sheet. 4 Ensuring the timely delivery of work as per quality standards. 6 Follow variable naming conventions & guidelines for the particular platform. 7 Have 90% understanding of the project through SRS doc before commencing work. 9 No use of social media either with phone or desktop. Save excel sheet where you want to save. Your Index.cshtml user interface looks like the following result. Go to the file location where your excel file is saved. Click Import from Excel button for import data from excel sheet and bind with HTML table. The following UI is shown, After clicking on Import from Excel button. Click “Export to Excel” button for export data from HTML table. When you click on “Export to Excel” button excel sheet will automatically download to your system. Open your excel file and match your records from excel sheet to HTML table, data will be same. I hope, this article would help you to understand about Import and Export data from Excel or HTML. In the end, You are expert in managing data from Excel sheet in MVC Application. Input-Output File Stream: How to work with File Input/Output Stream classes? Encryption-Decryption: How to perform same Encryption and Decryption in C# and Node JS? Kendo-Grid: How to work with Kendo Grid using Jquery? Angular-CLI: How to work with Angular CLI (Command Line Interface)? Previous articleHow To Create Useful Wireframes For Mobile and Web applications? Next articleHow to create a Universal Application for iPhone and iPad With Objective-C?